and took possession of our new and present building located at No. 156-158 Grand Avenue. FACTS REGARDING THE NEW BUILDING. A COMMITTEE on securing an available site for our new quarters was appointed on March 2, 1903. The Committee having performed their duties were discharged on June 5, 1905 The land for the new building was purchased on August 7, 1905. There was a parade through Astoria in the morning and a public reception during the afternoon and evening at which hundreds of the leading citizens of Astoria and vicinity, public officials from all parts of Queens, and a large delegation from the New York Veteran Firemen's Association were in attendance. The site of the present headquarters was purchased largely through the efforts of ex-President James F. Foley, who-was given valuable assistance by Fred C. Trowbridge, a member of one of the oldest and best-known families of Astoria and also a member of the Association. Edward F. Flanagan, Chairman; R. Peseux, W. H. Thompson, J. T. Allen, F. C. Trowbridge, B. J. McGowan, Thomas J. Cain, John P. Hynes, B. H. Tompson, D. M. Tompson, E. C. Northacker, George L. Casey, P. J. Bannon, E. Krombholz, James F. Foley, W. N. Mason, James H. Kelly, S. A. Matthews and John Horan. 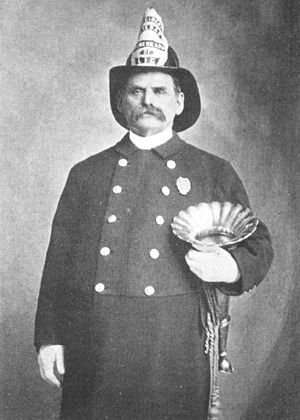 It was due to the efforts of the late Chief Engineer of the Fire Department of Long Island City, George Casey, that the first meeting was held in Firemen's Hall, 157 Fulton Avenue, on January 22, 1890, to discuss steps necessary to be taken to organize a Veteran Firemen's Association. On February 16, 1891 the parade hose carriage of Mohawk Hose Company No. I was bought by the Association from the Fire Commissioners of Long Island City, and it now forms one of the greatest attractions, among other relics of the past, in the rooms of the Association on Grand Avenue. The famous "Big 6," or Americus Engine, was presented to the Veterans Association by the following ten members on July 3, 1905: James F. Foley, Joseph T. Allen, Owen J. kavanagh, A. C. Woods, B. J. McGowan, Fred T. Hallett, P. A. Leininger, James Ingram, James H. Johnson. George H. Smyth. Signal lamp of "Big 6" was presented to the Association by Mrs. Tony Burke (widow of last Foreman of "Big 6"), September 11, 1905. It is valued at $500. 1912; Rockville Centre, October 3, 1912; Haverstraw, June 18, 1914; West New York, N. J., September 7, 1914. The opening of the Queensboro Bridge, June 12, 1909 dedication of Firemen's Monument, Riverside Drive, New York City, September 5,1913. 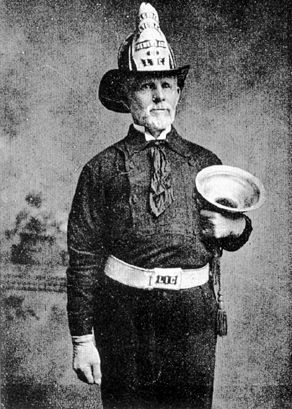 VOLUNTEER FIREMEN IN CIVIL WAR. Assistant Engineer Hose No. 40; Charles McK. Leoser, Adjutant. Captains--Co. A, John Coyle, Hose 22; Co. B, Edward Byrnes, Engine 16; Co. C, Michael C. Murphy, Hose 41; Co. D, John Downey, Engine 34; Co. I, John B. Leverich, Hose 7; Co. F, William H. Burns, Engine 6; Co. G, Michael Teagen, Engine 13; Co. H, William Hackett, Assistant Engineer Engine 20; Co. I, John Wildey, Engine II; Co. K, Andrew D. Purtell, Engine 14. Co. A, W. Burns, Hose 21; Co. B, Thomas Smith, Hose 56; Co. C, A. Gibson, Hook and Ladder 15; Co. D, Daniel Crowley, Engine 20; CO. E. William E. Fisk, Engine ?2; Co. F, Alfred A. Donald, Engine 17; CO. G, John Feeney, Hose 50; Co. H, William McCaully, Engine 40; Co. 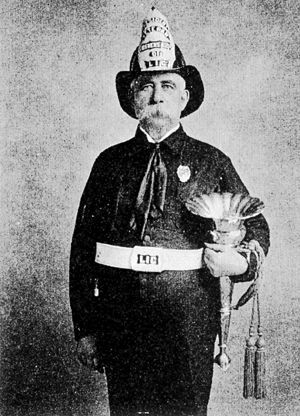 I, Charles B. Elliott, Hose 7, Williamsburg and Lieutenants William Gleeson, Engine 3; John J. Glass, Engine 16; Eugene C. Stine, Engine 31; John Phelan Hose 10; Michael Feeney: Hose 6; Matthew Stewart, Hose 50; John T. Lawrence, Hose 11; Washington Mullen, Hose 22; John P. Skehan, Engine 20. 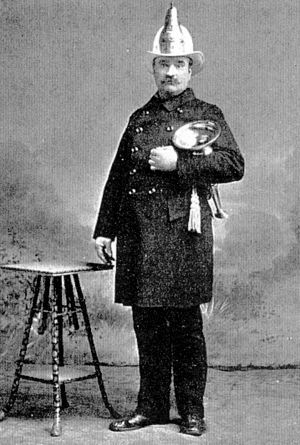 The regiment was merged into the Seventy-Third New York Volunteers, but the boys called themselves the Second Fire Zouaves to the end of their service. OUR FIREMEN. 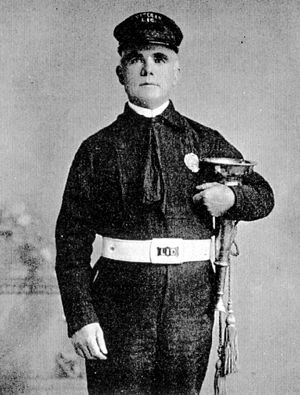 One of the most touching tributes to the old volunteer firemen was written by Eliza Cook, under the caption of "Our Firemen." But who plucks the human brand? Who will do the deed or die? 'Tis a fireman of the land! A health to hands that fight the flame.